The nasal septum is the wall between the nostrils that separates the two nasal passages. When the nasal septum is bent or crooked it can make breathing difficult, which may cause snoring or sleep apnea. A deviated, or bent, nasal septum can occur at birth or from some type of injury such as a broken nose. Surgery to straighten the septum is called septoplasty. What is Septoplasty or Deviated Septum Surgery? Septoplasty is a surgical procedure performed to correct a deviated nasal septum. It is used only when other non-surgery options haven’t worked. 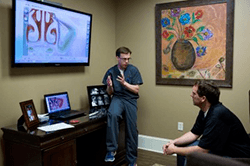 The procedure usually takes about 60-90 minutes and is performed in an outpatient surgery center. Before the surgery, the surgeon will look at your nasal passages and view the shape of your septum. A nurse will prep you for surgery and you will be given anesthesia. The surgeon will then use surgical tools to enter the nostrils and straighten the septum. The surgeon may need to cut or remove parts of the septum and reinsert them in the correct position. Results vary from person to person but most people see an improvement in their breathing. For more information on septoplasty, contact us at (205) 988-6858 or email us.